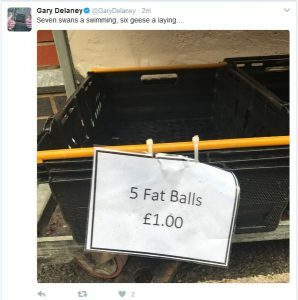 Gary Delaney posted a joke on twitter today at pretty much the same time I was on twitter. Here is the joke. Great idea! 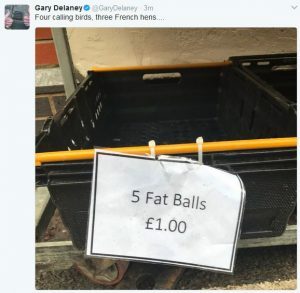 I’m sure ‘fat balls’ (a type of bird feed) has been done to death as a topic. I know my girlfriend NEVER tires of me showing her my FAT BALLS every time I’m in Poundland. However, while reading the joke I realised that the set-up was wrong. ‘Four calling birds, three french hens…’ lead on to ‘two turtle-doves’ so you’d expect it to be ‘2’ in the picture. Gary is a master of one-liners and so I’m not sure why he went for the feedline he did. I guessed it was a twitter character issue and left it at that. Refreshing my twitter timeline got me the same picture. Except he had ‘fixed’ the feedline. Now you are expecting ‘5 Something Something’ – the ‘joke’ is still the same but at least it makes a little bit more sense. Rarely will people see stuff like this and it is only because I was on twitter at the exact moment he posted it that I saw both versions. I screencapped them for this blog post and so did write the blog post.